Most investors obsess over share price increases, but how important are dividends? If you check out your portfolio minute by minute, day by day, then dividends can seem very trivial. When your portfolio is rising, a dividend payment can just seem like a small bonus. The importance of dividends, though, becomes more apparent if you take a longer term approach to investing. 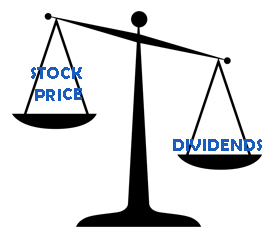 In this article we examine just how important dividends are. How do you actually make money out of stocks? So you've found a great company, you've opened a brokerage account and you've submitted some cash to purchase some stocks. How are you actually going to make money out of these stocks? This seems like a silly question - surely just buy low and sell high. Well, yes, sort of! The reality, though, is that you need to focus on TOTAL SHAREHOLDER RETURN (TSR). Total shareholder return adds the share price appreciation to the dividend to give you a total return. "Conventional wisdom estimates that slightly less than half the return from equities in any given year comes directly from the dividend, with the rest from the stock movement. But closer to 90% of total returns from the stock market can be attributed directly to dividends when dividend growth is taken into account." JP Asset management have also looked into the decade by decade total returns of the S&P since the 1930s which show how important dividends are in stabilising your returns. Capital appreciation has fluctuated in that time between -5.5% and 15.3% across the decades but the annualised return when reinvested dividends are included show varied returns of between 1.8% and 6%, highlighting far more consistency in long term returns when dividends are included. How important are dividends to your psychology as an investor? In one word, we think they're "vital". They mean that you actually get paid no matter what the stock price has done. Think about it this way, Procter and Gamble (owner of consumer brands such as Crest, Pampers, Always, Tide, and Gillette) has paid a dividend every year since 1891 and has increased its dividend every year for 60 years making it a dividend king. Procter and Gamble's share price has not gone up every year since 1891 so in those down years, the dividend has helped its investors to realize a return. Wall Street often has little enthusiasm for dividends as they aren't as "exciting" as corporate actions, buybacks, or acquisitions. However, we urge you to ignore the noise of Wall Street, though, and think like a long term owner, just as Warren Buffett always has. We think that a focus on dividends and dividend growth allows you to think more like a private business owner. Imagine if you bought the local gas station or grocery store. You would be focused on the revenue, margins, earnings and dividends paid to you. In fact, why else would you buy a private business? Almost certainly, it would be to get paid and you would likely be paid through dividends. Surely that helps you think about how important dividends are for you. You wouldn't worry about the day to day quotes that are thrown at you by other people which is essentially what the stock market is. When you buy a stock, we think you should focus on the same fundamental metrics that a private business owner would and do your best to ignore all the noise that Wall Street analysts throw at you. For other thoughts on how important are dividends, please see our article on the advantages of dividends.